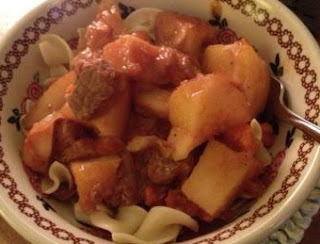 On cold or rainy days, Mom would make stew to feed a crowd. She often made this in a crock pot, but would sometimes bake for an hour or two in the oven. Put a few tablespoons of oil in a skillet and heat. Cut meat (lamb or beef) into bite-size pieces. Dredge in flour and brown in the hot oil. Stir in a can or two of Campbell's Golden Mushroom Soup and a can or two of tomato sauce or diced tomato. Season with salt and pepper, and a little red wine if available. Cook on low for 7-8 hours. Serve over buttered noodles.